A brush by F.M. Herring. Child's Patent Galvanic Hair and Flesh Brushes. 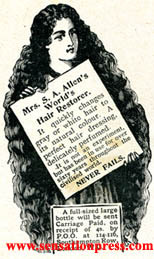 Mrs. S.A. Allen's Hair Restorer. Restores the colour to grey hair. Baldness prevented. Premature Grey Hair Regenerator. 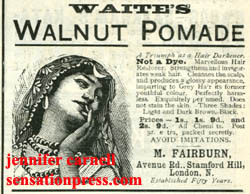 An advert from about 1884. Edwards' Harlene for the Hair. World Renowned Hair Producer and Restorer, 'Prevents the hair falling off and turning grey'.